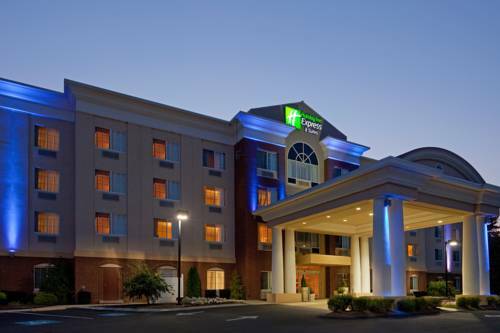 Middleboro, MA Hotel's Guests Enjoy a Warm WelcomeKnown as the cranberry capital of the world, Middleboro is full of lush lands and beautiful bodies of fresh water. The town is just a short drive from the nation's famous historic sites and several major corporations. So whether you're here for leisure or business, the Holiday Inn Express Hotel & Suites Middleboro - Raynham is the perfect resting point for you.Business travelers are happy to find that the hotel's location in Middleboro, Massachusetts is right off I-495 at exit 6 and close to companies like Johnson & Johnson, Nestle Waters, Sager Electronics and Ocean Spray Cranberries. Should you need to host a meeting in Middleboro, the hotel has more than 1,000 sq ft of flexible event space, as well as free Wi-Fi access to help you prepare your work.Don't forget to leave time for visiting all the exciting areas that surround this hotel's facility. Middleboro, Massachusetts provides easy access to the bustling streets of Boston, the charming shores of Cape Cod and the breathtaking mansions of Newport. We are also close to historic landmarks in Plymouth and Providence. When you're finished exploring the Middleboro area our hotel can help you unwind. Relax in our indoor pool and whirlpool and utilize the 24-hour Fitness Center. Enjoy our free, hot Express Start Breakfast Bar daily. Call today and let us help you plan your New England trip.